A formal request had come to the Board of Management of Dr. Graham’s Homes in April 2010 from the Council of World Mission (SAARC) in conjunction with Commission of Churches in India to hold the South Asia Pastors’ Conference 2010 at the Homes in early June when the school would be on summer vacation. The permission was formally granted by the Board of Management at its meeting held in April 2010 as it was felt it was a great honour and privilege to host such an important event in the Christian Calendar of the Church of North India. It would not only be an ideal platform to garner goodwill and advertisement for the Homes, but, above all, the blessing to be so chosen was a privilege that no right thinking Christian would deny. We were privileged to have with us delegates from all over India comprising of the Church of North India, Church of South India, Free Presbyterian Church of India, Baptist Church of North-East India, Methodist Church and the Salvation Army. The churches representing South Asia were National Churches Fellowship of Nepal, National Council of Churches, Nepal, Churches of Ceylon, Churches of Bhutan, Churches of Bangladesh and also a representative from ‘The United Church of Christ’, U.S.A. The delegates numbering about one hundred which included Pastors from local churches were lodged in Ahava, Graham House, Wolseley House, Elliott and Assam Cottages. Besides bed tea which was served in the respective place of lodging, all other meals were centrally catered for by our Central Kitchen at the Crozier Club. The Conference started with a welcome ceremony at the Jarvie Hall. All delegates were presented with button flowers and school khadas by Mrs. Y. Hishey, Mr. S.L. Banerjee and staff on the compound. The band from S.U.M.I. accompanied the delegates to the hall and the Bursar, Mr. D. Foning gave the welcome address on behalf of the Management of Dr. Graham’s Homes. The Theme of the Conference ‘Justice at the heart of Faith’ was then launched and renowned speakers like Dr. Daniel Prem Kumar, Rev. Dr. David Silver Raj, Rev. Dr.Roger Gaikwad and others went ahead with the seminars which were conducted from 10th to 12th June. The Conference was most appropriately concluded on the 12th of June with the launching of ‘Campaign against child labour’ held at Kalimpong Town Hall which was attended by students of the local schools and many dignitaries from Kalimpong. The Valedictory Worship was held at the Jarvie Hall where communion was celebrated by the Moderator, The Rt.Rev. Dr. Purely Lyngdoh, accompanied by the Deputy Moderator, Rt.Rev. N.K. Marandi and General Secretary of C.N.I., Rt. Rev. Enos Das Pradhan. Many people went out of their way to make this Pastors’ Conference of South East Asia (SAARC) 2010 Conference such a huge success: Thanks are due to Mrs. Y. Hishey, for her ready advice and support; Mr. S.L. Banerjee for playing such an active role; Ms. Ruth Glashan,; Mr. Larry Game; Mrs. Sabita Lama; Ms. Christine Guest; Mr. & Mrs. Barker; Ms. Janet Foning; Sr. Sutherland; Mrs. Dechen Washington; Ms. Aity Rai; Nurses of S.M.C. and Lucia King; Mr. Farooq Mazhari and his staff at central kitchen; Mr. Anil Shankar and his workshop staff; staff from Green House. Also thanks to Mr. N.R.Pradhan, Principal, Staff and students of S.U.M.I for their generous help during the event. Most surely our Homes will continue to be blessed in days and years to come. It was indeed a historical and memorable day for Kalimpong when on the 18th of July 2010, we could welcome the Queen’s Baton as it passed through Kalimpong. The Baton was handed over by Sikkim Delegates to the Darjeeling Authorities at Rangpo, Sikkim/West Bengal border. The Baton was received by the Additional District Magistrate, Mr. Sherpa, and the Sub-Divisional Officer of Kalimpong, Mr. Amayas Tshering, on behalf of the people of Darjeeling. Nearly twenty six schools of Kalimpong, N.G.O’s, Clubs and various communities of Kalimpong welcomed the Baton with cultural programmes. The forty five minute road show near Rangpo on the West Bengal side was a colourful affair with school children presenting dances from various ethnic communities. Dr. Graham’s Homes School was given the honour of welcoming the Baton at Chitrey, Teesta near the famous confluence of the rivers, Teesta and Rangit. Our school band braving the inclement weather played the school song and other patriotic numbers. They all looked very smart and did the school very proud. Senior boys and girls also accompanied the band with welcome banners and, as usual, with cheers that is typically associated with the Homes kids. The ‘live mascot’ was one of our Class III boy, Tenzing Sherub who as ‘Shera’ was the star attraction. Mr. D. Foning gave a running commentary about the relay and the historical background of the Baton at Chitrey, Teesta. The Dr. Graham’s Homes band and senior children were accompanied by Mrs. Y. Hishey, Mr. & Mrs. D. Foning, Mr. & Mrs. S.L. Banerjee, Mr. Pravin Pradhan and the Band Master. All the students were treated to sumptuous lunch packets after the event and came back drenched and tired but very happy to have had the privilege to represent the Homes by participating in such a landmark event which they will remember throughout their lives. The 3 K TOUR, Kolkata, Kathmandu & Kalimpong - Much, much more than a holiday!!! You too can experience the wonder of it all! The Charisma, Chaos, and Cacophony of Kolkata. The Mystery, Magic and Majesty of Nepal, The Dignity, Delight and Dedication of Dr Graham’s Homes. 4 Nights, 3 Days in Kolkata:- Guided tours, sail on the Ganges.7 Nights, 6 days in Nepal:- Including 4 days trekking to Namche Bazaar on the Everest trail or escorted safari and sightseeing in the Chitwan game reserve. Optional flight to Mount Everest. 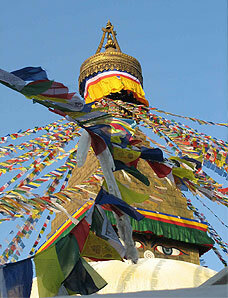 3 Nights, 2½ days in Kalimpong:- Dr. Graham’s Home and surrounding attractions. Weekly Bazaar. Experience the flight along the foothills of the Himalayas followed by the motor ride to Kalimpong and an unforgettable overnight Darjeeling 1st Class sleeper train to Kolkata. Final day and night relaxing at luxurious "Vedic Village" outside Kolkata. Total cost – All inclusive £1800 (excluding Return Air Fare UK to Kolkata, Visa charges and Travel Insurance)This is a non-profit venture and any surplus is refunded. Led and organised by John Webster, formerly Chaplain and Farm Manager at Dr Graham’s homes. In February 2006 9 cyclists successfully completed, (3 with a little assistance), a pilot run of 665K (412miles) from Kolkata at sea level to Kalimpong at 4,500ft in the Himalayan foothills. They enjoyed and endured 7 days of an unforgettable journey experiencing at first hand the city, town, village and rural life of West Bengal and raised over £20,000 for Dr. Graham's Homes! Five nights were spent under canvas and full back up support and services were provided throughout. 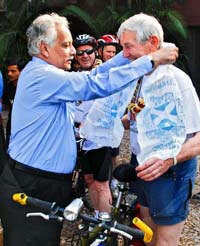 In February 2008, 10 cyclists repeated the feat and raised an amazing £40,000 for the Homes. If you would like to take part in this life-changing adventure in February 2008 the following are the only" qualifications" required. (1) The possession of a mountain bicycle! (2) A reasonable degree of fitness - sufficient to cycle between 70 (shortest) and 130 (longest) km per day [43-80 miles]. (3) A considerable degree of sociability and a willingness to tolerate minor inconveniencies! (5) Preparedness to pay all travelling and subsistence expenses- estimated at £1500 which includes everything- 5 nights in good hotels, return flights from UK to ¬Kolkata, all meals and tentage, back up support and the thrill of an Indian Railway sleeper train! No subsidies from the charity will be offered. Simply we consider it immoral to use monies donated to the charity to support fundraising ventures of any sort. Surplus if any to the £1500 will be of course refunded. The joy and satisfaction of completing the challenge will be far out-weighed by the rewards of helping a child to "walk this earth with dignity". Please complete the Booking Form and return by, 30th September at the latest. Places, up to a maximum of 20, will be allocated on a first come first served basis. 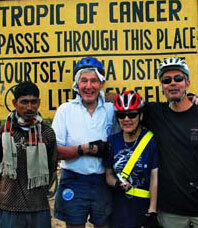 Depart UK 11th or 12th Feb to arrive in Kolkata in time to commence cycling on Sunday 14th at 8 am. (You may wish to delay your departure to tour further on India, Nepal or Sikkim). It is worth adding that this bike ride is not a race and it is quite possible (and acceptable) that due to fatigue or whatever you choose to put your bike in the back up vehicle and ride in comfort for the whole or part of a particular day!